All car, truck, RV, marine amplifiers and repeaters listed below are compatible with your Tbaytel service. Tbaytel Vehicle Signal Boosters for cars, trucks, RVs, boats and other vehicles. Are you searching for the best possible Tbaytel truck or car signal booster? If so, then you’re in the right place. Tbaytel offers a quality service and that is probably the reason why you would like an enhanced signal reception for your car. Tbaytel, a Canadian telecommunications company in the City of Thunder Bay offers diverse services to its customers, from high speed internet, Tbaytel Fibre, voice services and Digital TV among others. Irrespective of the powerful Tbaytel 4G/LTE advanced network, coverage in RVs, boats, trucks and cars can suffer a lot. This is where a Tbaytel signal booster specifically for trucks and cars can really help. Canadians enjoy one of the fastest wireless networks across the world and even one of the best in developed economies. Tbaytel has been offering telecommunication services since 1902, which have evolved into the elaborate cell phone networks they are today. The company has consistently changed with shifting technologies to meet the communication needs of the day for over 110 years. Apart from having an elaborate HSPA+ network already, Tbaytel launched a powerful new LTE advanced network in 2015 with maximum 100 Mbps download speeds with average download speeds of between 10-20 Mbps. Of course, just like any other wireless network out there, Tbaytel speeds vary a lot. The coverage is affected by topography of an area, network load, and device type, and its signal strength. With a great signal booster you can continue enjoying the Canadian company’s diverse services and products as well as new services when they’re launched. Ensuring your truck or car has better signal strength is very fulfilling. It ensures you’re always connected and in communication wherever you're traveling. Tbaytel signal boosters specifically for vehicles will provide this critical advantage. However, it is important to look into the different devices really well. Each is made with cars, buses, marine vehicles or RVs in mind. Getting the right one is very important. Have in mind what you want to accomplish with a signal, and buy the right booster for the job. The Tbaytel signal boosters designed for cars and trucks fall in a number of categories. Nonetheless, a number of signal boosters also work in more than one category. As you buy a signal booster, remember some are made with a particular type of vehicle in mind, and should be bought for such a vehicle for proper compatibility. Single cradle user Tbaytel cell phone signal boosters. While looking for single cradle signal boosters there’re a couple that work very well. Always go for a signal booster can better amplify the Tbaytel signal strength around you. This high urban, 3G single cradle user booster is able to boost all 3G data and voice signals for virtually all the carriers in US and Canada. The adjustable cradle makes sure it fits any type of phone. This dual-band car and truck booster kit ensures an inbound signal is accomplished to allow reliable reception of data and voice signal. It also boosts outbound signals to transmit data and voice efficiently from a cell phone. It is a mobile reception enhancer usable in diverse types of cars, camper vans, RV’s, buses, boats and trucks for a single user device. The signal booster provides a 23 dB gain on the higher side and requires the data gadget or phone to remain inside the cradle for the signal to be boosted. This signal booster helps to boost the cell phone coverage in any kind of vehicle out there. The signal booster works for all 3G, HSPA+, voice and 4G, 4G/LTE phones and supports all Canadian and US carriers. Reception is boosted from a single cell phone or mobile gadget that has to be fitted inside the cradle. It is one of the easiest to install and increases outbound and inbound call signal for a very stable connection. It enhances a reliable internet activity as data signals are boosted. Using the signal booster also increases your phone’s battery life; the weBoost Tbaytel Drive 4G-S takes over most of data transmission work, preserving phone's battery power. Multi-user wireless Tbaytel signal boosters for cars and trucks. This booster is designed to boost vans, trucks and cars cellular coverage and works perfect for 3G and voice mobile devices for diverse carriers in Canada. Reception for tablets, Smartphones and other mobile devices is simultaneously boosted. This Tbaytel signal booster is Wilson Mobile’s 3G latest version and hardly needs any cradle to support mobile data gadgets - It boosts signal to multiple phones all at once. Apart from offering a 50 dB gain, it comes with all the necessary parts to set up a powerful phone and mobile data booster installation. The multi-user wireless signal booster comes with a magnetic antenna, DC power adaptor including a low profile thin antenna and a fitting antenna cable. Drive 4G-M supports different mobile data gadgets and multiple phones at the same time without a cradle. The Wilson Mobile 4G latest version offers a gain of 50 dB, great for boosting the signal for multiple wireless devices you might be using in boats, RVs, SUVs, vans, trucks and cars. It boosts 3G, 2G, and 4G LTE as well as voice signals for all the carrier networks in North America. This Tbaytel boost kit by weBoost includes Magnetic antenna, DC power adaption, and low small profile antenna handy where the longer antenna isn’t needed. It is quite easy to fit and install and doesn't require extra tools or equipment. It is a robust signal booster to enhance signal for Smartphones, Laptops and Tablets among others in all types of boats, RVs, trucks and cars. A very powerful amplifier, the Drive 3G-X weBoost booster pulls in wireless signals around and goes 60 percent farther to assure maximum reception. It comes with a free 4-inch low profile magnetic mount outside antenna and extra slim velcro inside mount antenna plus a 12V power outlet extender. The Tbaytel signal booster for 3G and 2G voice and data for all Canada and US carriers comes with a maximum 50dB Gain. It is ideal for vans, cars, trucks, boats, RVs and SUVs. No cradle required to use the signal booster, which supports more than one mobile data device or phone. As it takes over the signal task, the signal booster saves your phone's battery life. This weBoost signal booster for large vehicles such as motor homes, recreational vehicles and campers offers a 50 dB maximum Gain. It boosts 2G voice and 3G voice and data networks while supporting multiple phones, including devices related to mobile data promptly. It comes with a rugged and durable antenna spring mounted to provide great reception for large vehicles. Boosted signal range is up to four feet radius if interior patch antenna. It is in a form of booster kit that is simple to install, without the need of a professional. It also protects your battery life by taking the signal function from your phone. 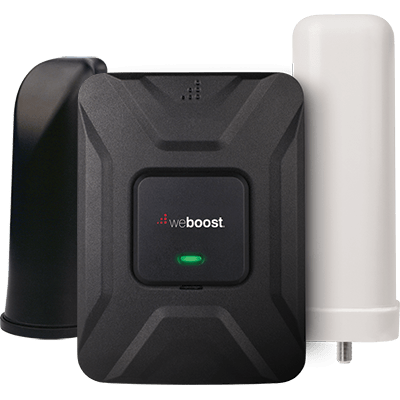 weBoost signal booster kit RV 4G is great for amplifying 3G and 2G voice and data as well as 4G LTE data and voice and works with all North American carriers. It is capable of covering up to 1,500 square feet, particularly with an outside existing strong signal. The signal kit comes with cables, indoor desktop antenna as well as an easy to use installation guide in your camper, motor home or RV. It offers a maximum 60 dB gain. If the outside signal is strong, the booster signal range can be as much as 1,500 square feet, 1,000 square feet for a medium outside signal and 150 square feet in case of a poor outside signal. 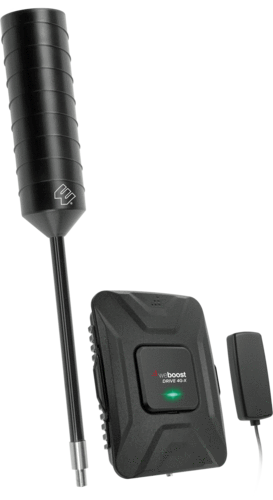 Drive 4G-X weBoost signal booster kit. Great for boats and vehicles such as RVs, SUVs, vans, and cars. It boosts the signal for 4G LTE voice and data, 3G voice and data as well as 2G voice networks. It works well with all Canadian and US carriers to support multiple mobile data gadgets and phones at once without the need of a cradle. The 4G signal booster enhances the signal effectively inside a vehicle even with the lowest signal possible as well as enhancing the speed or quality of existing signals. It has a 50+ dB gain and doesn’t require heavy maintenance. The Tbaytel signal booster includes a magnetic outside antenna, slim profile type of antenna and amplifier. It boosts internet speeds, enables text and talk communication. An amplifier that is very handy for diverse professional uses. Drive 4G-X OTR Truck signal booster kit. The weBoost 4G-X OTR is made specifically for OTR trucks. What is OTR? O.T.R. acronym stands for “Over The Road” and referred to freight trucks and transportation trucks that spend a lot of time on the roads while being driven long distances such as interstate distances. This truck signal booster kit enhances the reception for 2G voice, 3G voice and data as well as 4G LTE voice and data for virtually all carriers across North America. It is recommended and designed with large vehicles in mind like OTR freight trucks with a small coverage area within the trucks. It can also be used for other small areas such as inside motor homes, RVs and campers. The signal booster offers a maximum 50 dB gain to support multiple devices such as laptops, Tablets and Smartphones within freight trucks, trailers, motor homes and recreational vehicles. Tbaytel Marine signal booster for multiple yachts, ships and boats. This weBoost marine booster kit is specifically made to amplify the cellular coverage of many marine vessels, from ships, yachts to boats. It boosts signals for 3G and 2G voice and data for diverse carriers in Canada. Also provides a 50 dB maximum gain. 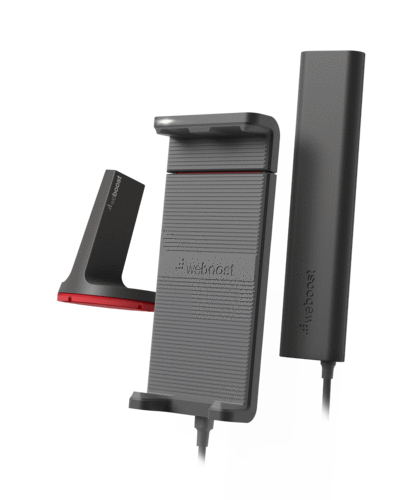 The booster enhances phone calls, data connection and GPS signal. Comes with a weather resistant marine antenna to enable better internet speeds, improve talk and text communication while out in the sea where the signal is always poor. No cradle is required to use it.